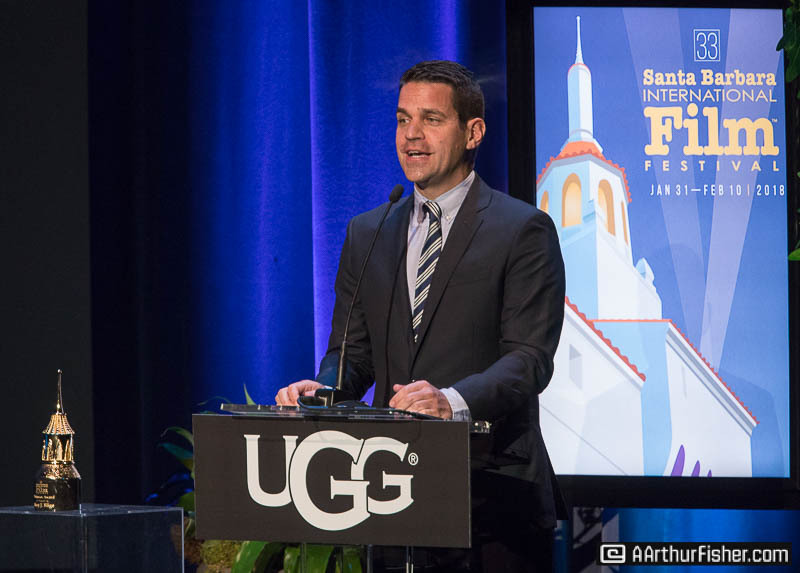 It was an unusually warm and glitzy February night in Santa Barbara as the biggest stars of the 2017 movie season took to State Street to shake the hands of excited fans, sign autographs, take pictures, give interviews to the many television reporters lining the red carpet, and accept the 2018 Santa Barbara International Film Festival’s Virtuosos award. 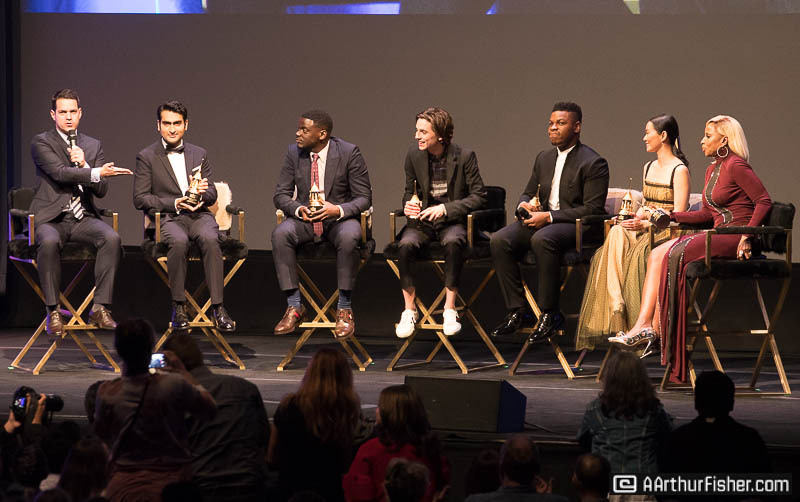 The Virtuosos award show has long been a star-studded and glamorous evening and the 2018 edition was no exception. 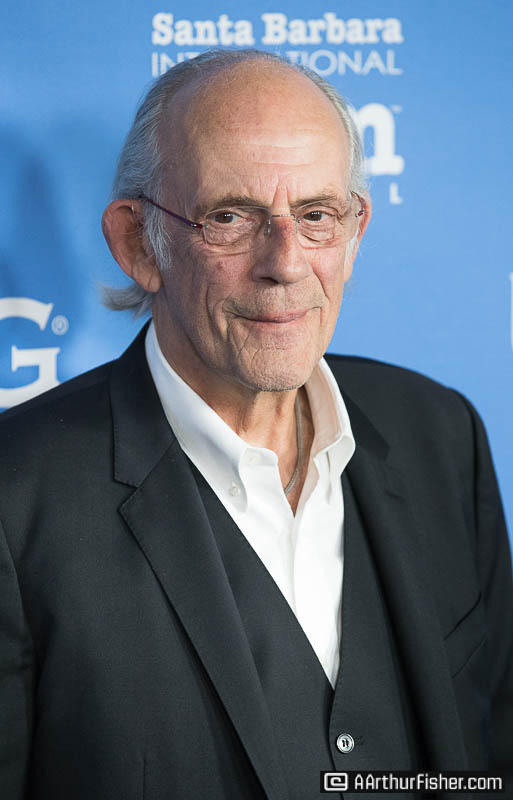 This year’s recipients of the golden Arlington Theatre-shaped awards were presented (by Christopher Lloyd none the less) to Mary J Blige, John Boyega, Timothee Chalamet, Hong Chau, Daniel Kaluuya and Kumail Nanjiani. As the sold-out crowd began to fill seats at The Arlington, word was spreading that Gal Gadot, who was scheduled to receive an award, would not be attending. 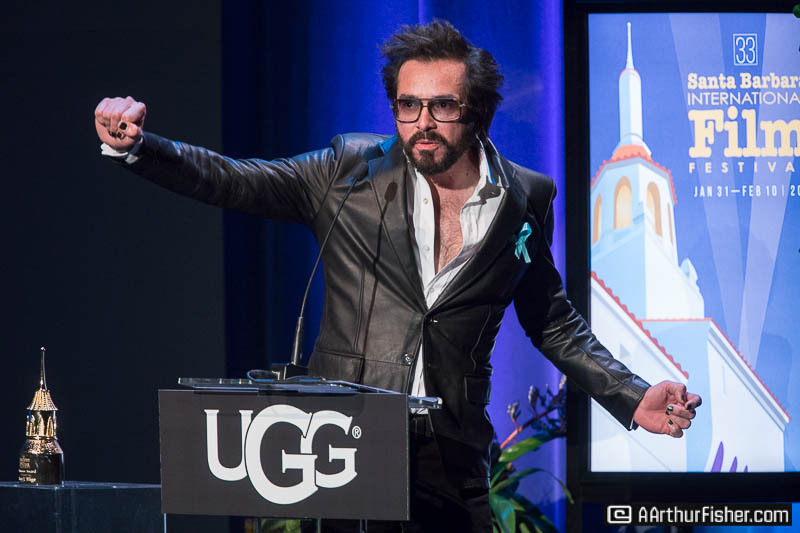 When Roger Durling took the podium, he confirmed the news, letting everyone know that Gadot had caught this season’s unrelenting flu. Disappointingly, even Wonder Woman gets sick. But, as Durling reminded the crowd, the evening was still chock-full of talent. 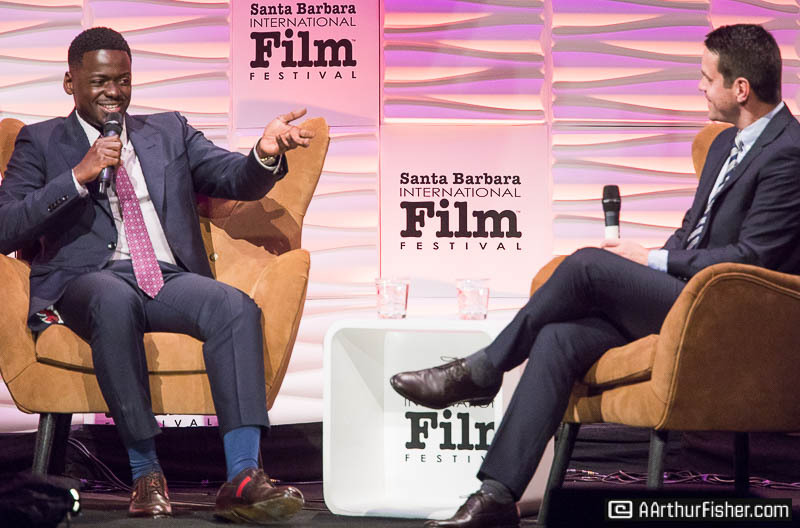 Moderating for the 8th year in a row, Dave Krager gave one on one interviews to the stars. 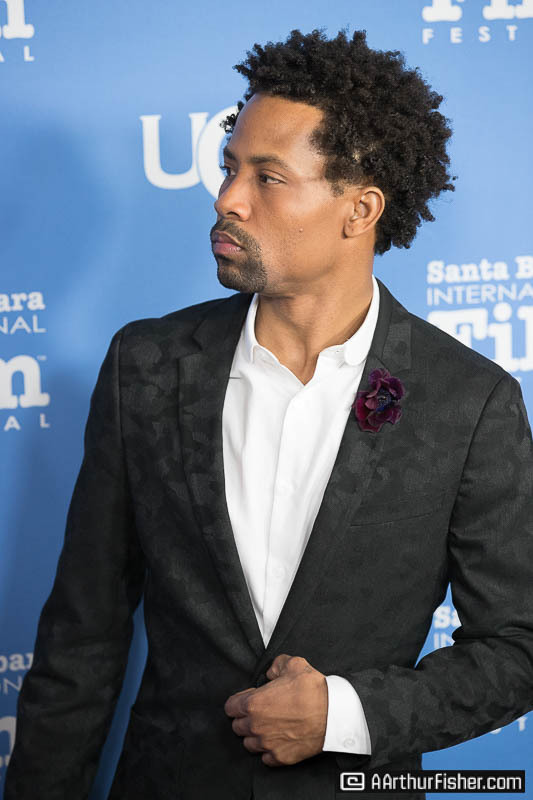 He talked to Mary J. Blige about her role as Florence Jackson in the Netflix movie Mudbound. 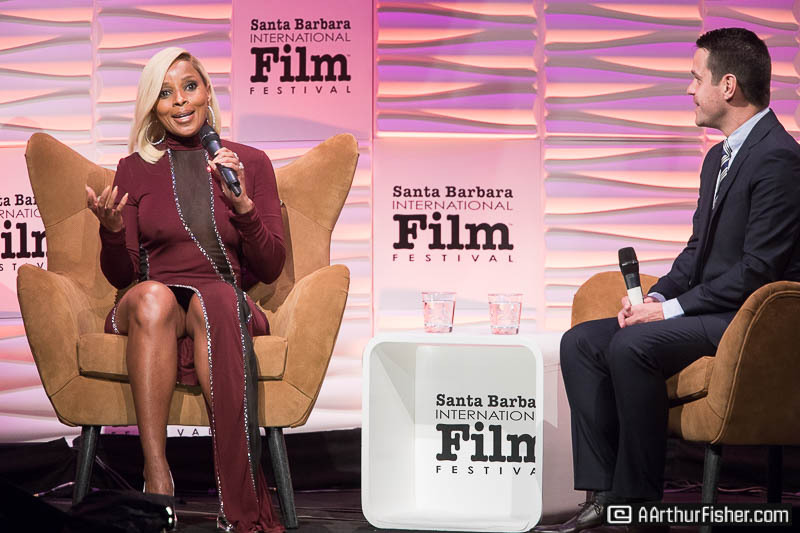 Blige is the first person in Oscar history to be nominated for both an acting and song writing award. 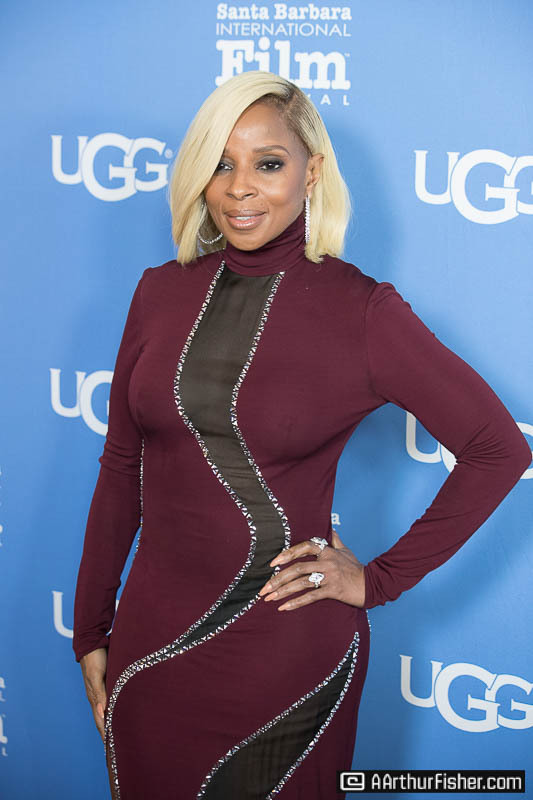 “Things like this just don’t happen,” Blige said. Much to the audience’s delight, she confirmed she would be singing the song she wrote for Mudbound, “Mighty River” at this year’s Oscars. Star of the movie Detroit, British born actor John Boyega, was up next on The Arlington Stage. 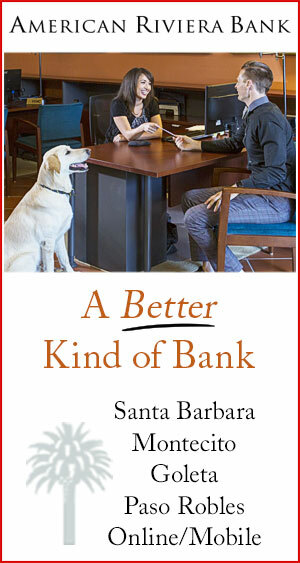 First thing he did was give Santa Barbara a big, ole shout-out, mentioning it was his first time in our town. 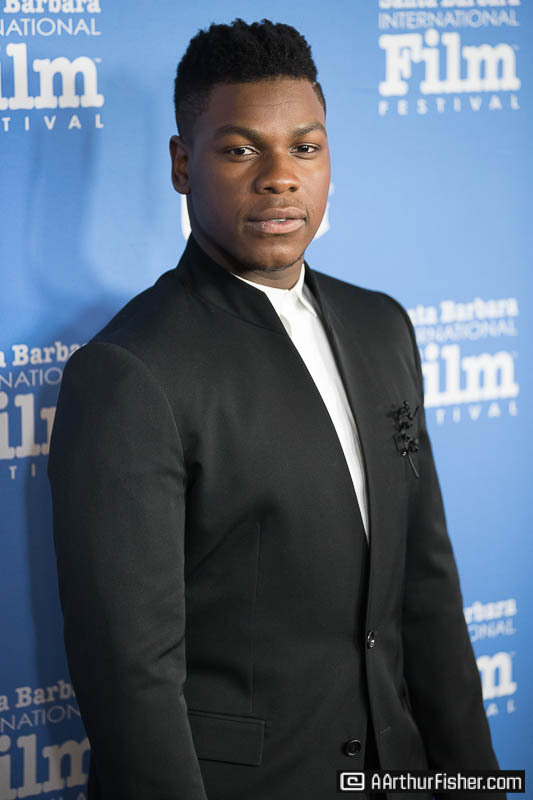 Boyega may be best known for his role in Star Wars: The Force Awakens. 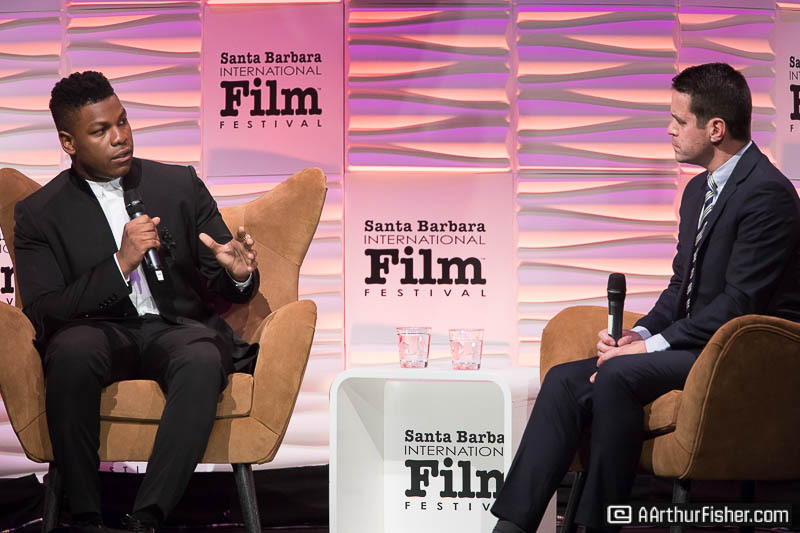 When asked about acting in Detroit vs. Star Wars, Boyega said “I was done with space and robots, I was ready to be part of something that matters. 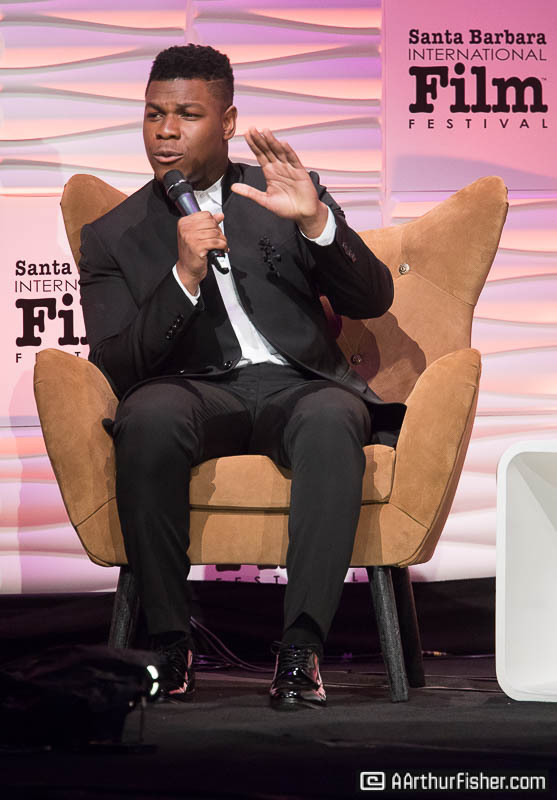 Star Wars- that’s where you get the check, but it’s longevity that matters.” Boyega has won several awards for his depiction of the real-life Melvin Dismukes during Detroit’s 1967 12th Street Riot. Twenty-two-year-old Timothee Chalamet, the youngest best-actor Oscar nominee in nearly 80 years, was next to be interviewed. Nominated for his role in Call Me By Your Name (which is also nominated for Best Film), Chalamet was funny and charming as he spoke of never getting acting roles at his performing arts high school because he looked too young. When asked about the infamous peach scene in the film, he joked that it was the role he’d been waiting for his whole life. In more seriousness he said he wanted to stay true to the book the film was based on and “it was in the book, so it had to be done.” Still looking young for his 22 years, Chalamet commanded the stage at The Arlington and kept everyone laughing. Hong Chau, star of the Alexander Payne directed movie Downsizing has been nominated for both a Golden Globe and SAG award for her role. She told the audience that she almost wasn’t considered for the movie because Payne saw her name and thought she was Chinese and wanted a Vietnamese actress. Though Chau isn’t a common Vietnamese name, she was, in fact, born to Vietnamese parents, and eventually got the role. “I was ready to cage fight someone for that role,” she said. At one point she looked at the giant movie screen behind her, waved to herself and giggled. 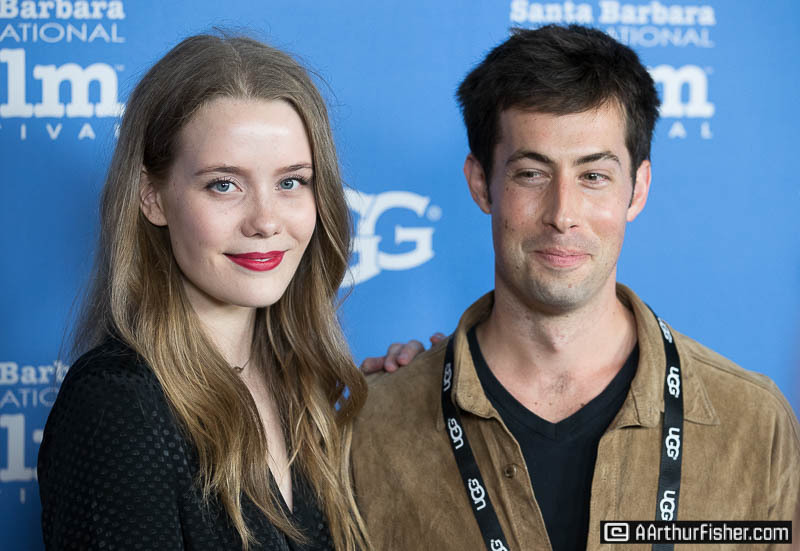 It was clear she was just as happy to be at The Santa Barbara Film Festival as we were to have her. 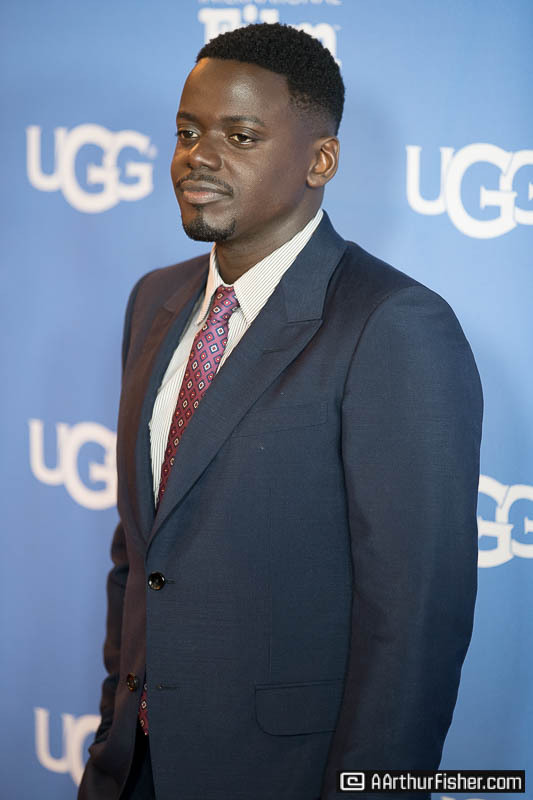 The star of the hit film Get Out, Daniel Kaluuya, was next on stage. 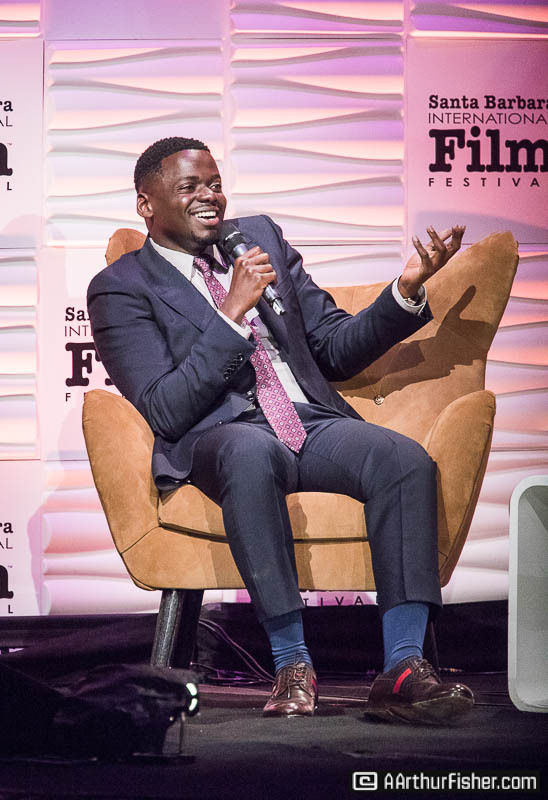 When asked how it felt to be an Oscar nominee, Kaluuya said it felt surreal, like he’d scribbled his own name in on the list of accomplished actors. “I don’t think you’re allowed to beat Denzel Washington in an acting competition,” he said. 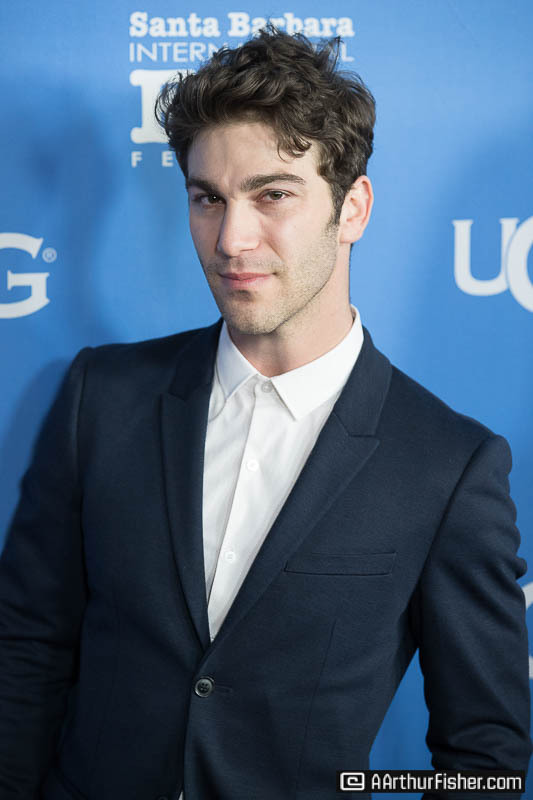 When asked about filming the emotional scenes of the film, he said they only had 23 days to shoot, so there was little time for retakes, “I wasn’t trying to be good,” he said, “ I was trying to be honest.” When asked about working with director Jordan Peele he said, “I thought he was going to get in trouble and I wanted to get in trouble with him.” Get Out is nominated for Best Picture, Best Director, Best Screenplay and Best Actor at this year’s Academy Awards. 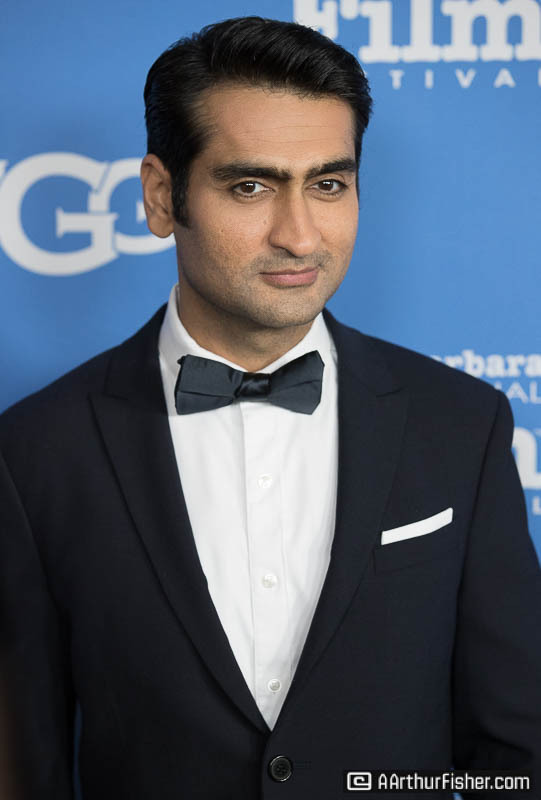 Finally, Kumail Nanjiani, cowriter and star of The Big Sick, hit the stage. He was undoubtedly hilarious but spoke tenderly of his wife, Emily V. Gordon who was in attendance. She co-wrote the film and it was based on her and Nanijani’s relationship. “What a gift” Nanjiani said of writing with Gordon. He went on to say he was thrilled to hear they were nominated for an Oscar because “the person I love the most in this world was nominated!” He discussed Gordon’s illness, which is central to the true- to -life film. 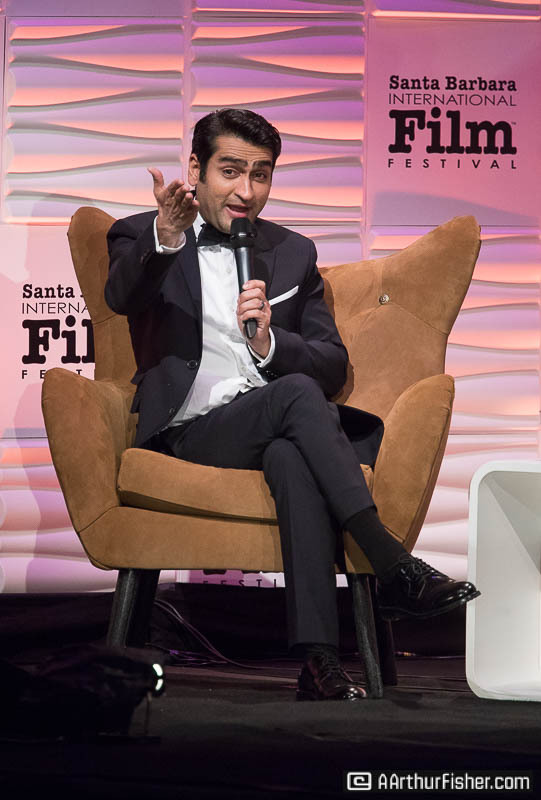 He said The Big Sick was something he had to get out before he could make anything else. 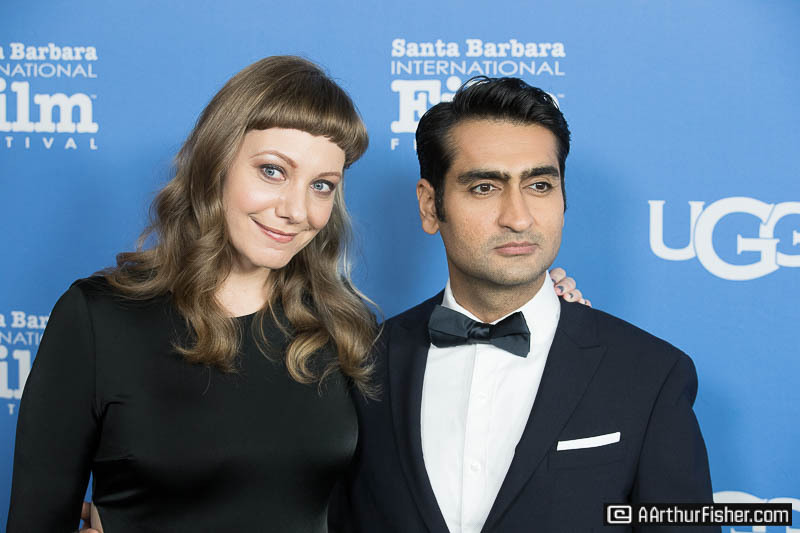 He joked that he’d be really upset if someone else wrote the story of a Pakistani-born man who falls in love with an American girl while she’s in a coma before he and Gordon could get to it. The evening wrapped up with a panel featuring all the award recipients. It was light-hearted and hilarious due in part to the nature of Krager’s questions and in part to Nanjiani’s rapid-fire jokes. 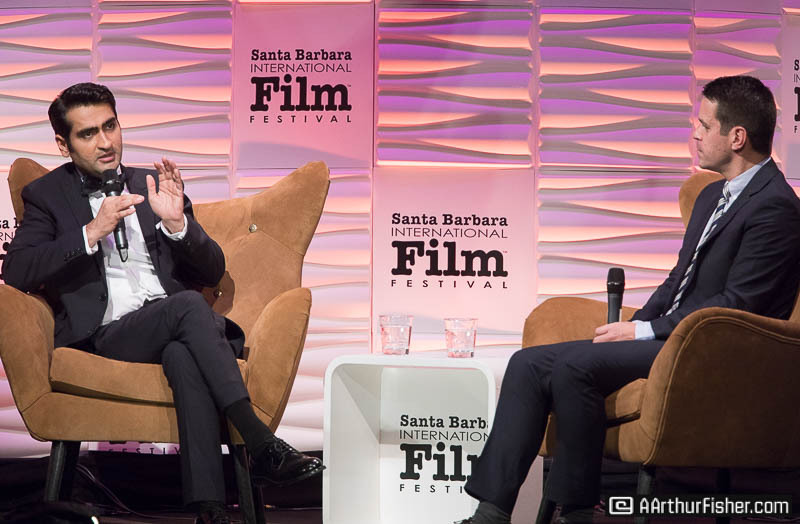 Krager’s questions ranged from “would you rather be a musician than an actor?” (Mixed reactions) to “what’s your best impression?” (Pinocchio- Boyega, Matthew McConaughey- Charlamet, Karl from Sling Blade- Blige, Will Ferrell- Kaluuya, a guy who was born in Pakistan but has been in the US for 15 years- Nanjiani.) The star-studded evening ended with- what else-? A Selfie of all the Virtuosos recipients on stage. The night was glamorous, inspiring and full of laughter. Durling was not kidding when he said there was talent in the room. 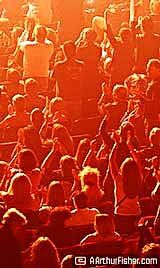 The room was, in fact, full of Virtuosos and an audience who could not get enough of them.